Time travel, immortal sorcerers, Neanderthals, werewolves, steampunkish science, magical underworlds, the Olympics, and variety acts; there’s a lot going on in this book… perhaps too much? Who cares? The Extraordinaires is certainly jam-packed with enough interesting events, likeable characters, and non-stop action to distract you from the slight feeling that you’re holding a kitchen-sink in your hand rather than a book. Kingsley Ward is a gentlemanly young man who seeks fame as a magician and to control and hide his true nature. Dragged from his spectacularly failed stage debut by the strange and lovely Evadne, and drawn into danger and adventure by the disappearance of his father, Kingsley’s adventures hardly let up from first page to last. The main characters are interesting enough to win the reader’s attention, though Kingsley is a little bit boring, in spite of his affliction and career choice, and Evadne is almost too cool for words. Interestingly, the villain, Soames, is characterised more subtly than the leads, emerging as an intriguing and deliciously business-like bad guy. 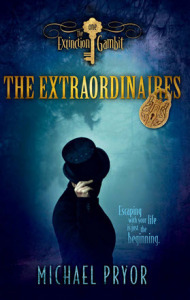 The Extraordinaires is a pleasing, self-contained story that will capture the imagination of readers with its own wealth of imagination, and entertain with the witty banter between the leads.